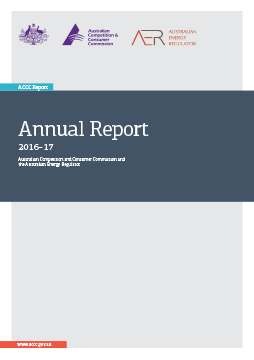 Annual report of the Australian Competition and Consumer Commission (ACCC) and the Australian Energy Regulator (AER) in accordance with Section 46 of Public Governance, Performance and Accountability Act 2013 and sections 44AAJ(1) and 171 of the Competition and Consumer Act 2010. Further information on our performance is included in the ACCCount publication. This report was amended on 13 November 2017 due to a court order.